A female Decepticon ninja? A redeco of Arcee? Why does this all feel so familiar? 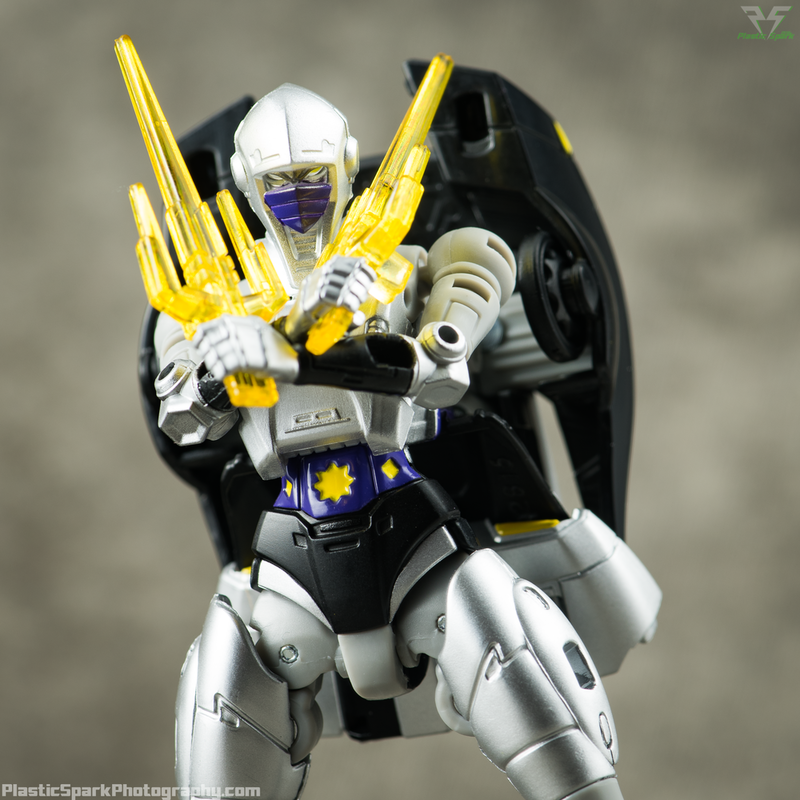 Mirroring their third party contemporaries, Impossible Toys, Takara has retooled and repainted the incredible Thrilling 30 Generations Arcee mould into Dr. Fujiyama's robot ninja; Nightbird! Now dubbed "Nightbird Shadow" and fully welcomed into the Decepticon fold, insigna and all, This Arcee repaint is a fun use of the mould and an absolute stunner to behold! 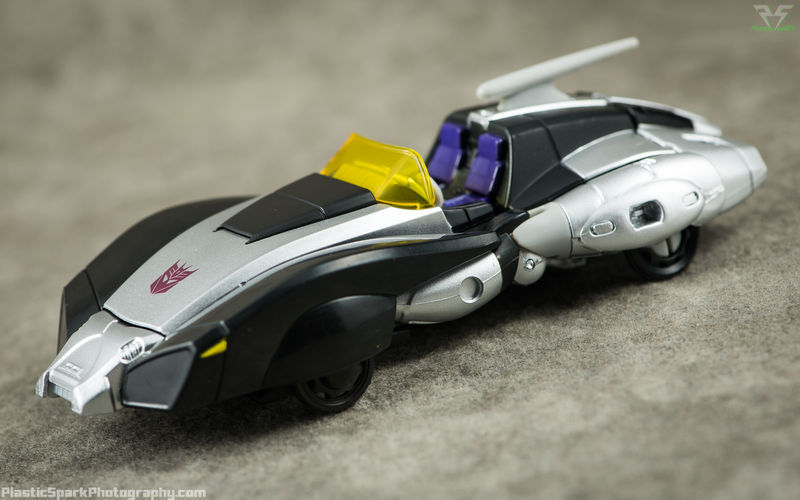 Nightbird's vehicle mode is a metallic silver and gloss black treatment of the familiar G1 Arcee space cruiser. It looks absolutely incredible in these colours and in my opinion the silver really brings out some of the smaller details in a way that white and pale pink couldn't quite pull off. The front of her vehicle reminds me simultaneously of Ravage and Lazerbeak with it's gloss black fenders and yellow painted lights. The yellow windscreen and purple upholstery finish off this mode wonderfully. Nightbird didn't have an alt mode in fiction until this point and despite being a retool I think Arcee's vehicle mode suits her quite well. 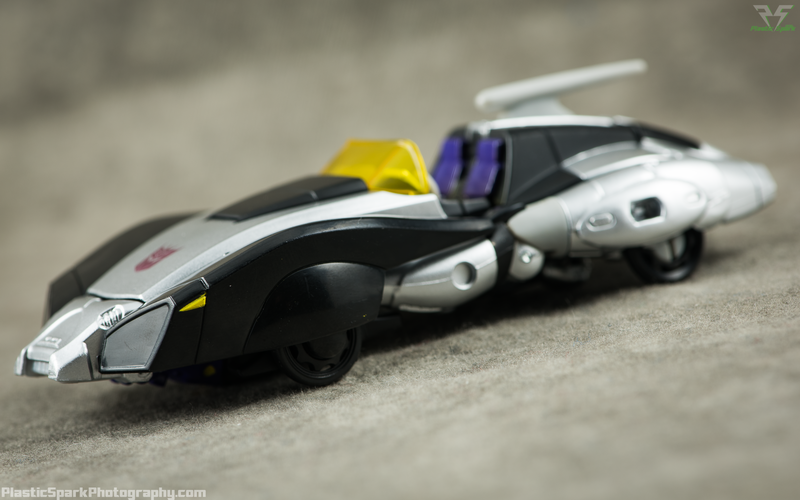 Nightbird's bot mode is gorgeous. She of course carries the same backpack that Generations Arcee is burdened with but I feel like she carries it better. Even though her G1 incarnation was a clean humanoid design I don't find the kibble as jarring on Nightbird. Instead of seeing a classic character that was traditionally quite slender and clean burdened with necessary car parts I see a killer ninja assassin with a sweet jet pack. 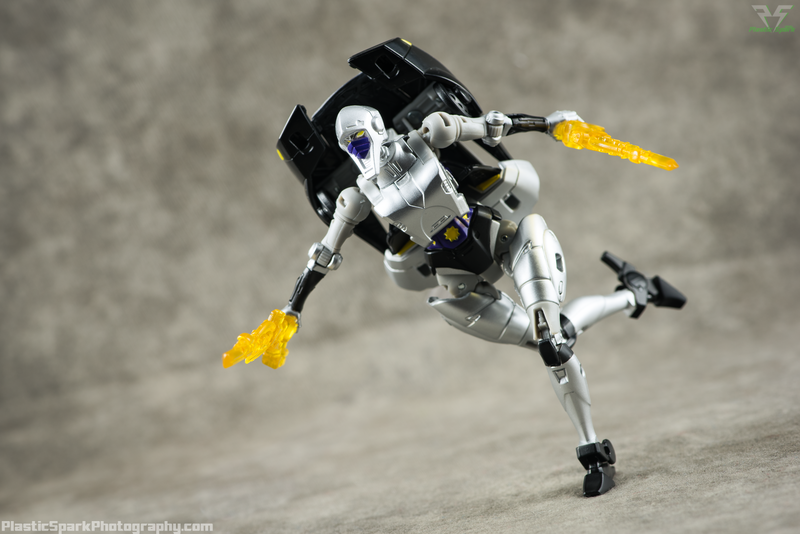 Nightbird's articulation is impressive and she is able to pull of acrobatic poses with ease. I still wish this mould had a waist swivel but I can forgive it given her transformation. DO NOT INSERT NIGHTBIRD'S WEAPONS PAST THE TAB ON HER HANDS! 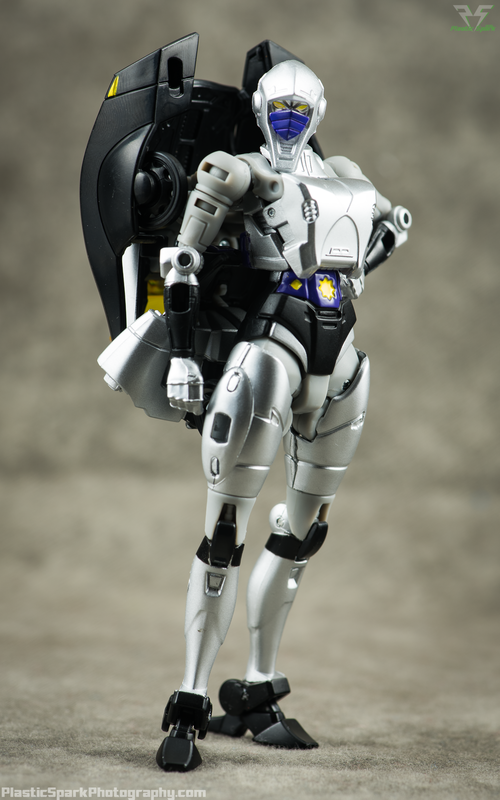 YOU MAY CAUSE IRREPARABLE DAMAGE TO YOUR EXPENSIVE IMPORTED FIGURE! I DID IT FOR THE SAKE OF PHOTOS AND GOT LUCKY! DON'T DO IT! Despite being an expensive import repaint of a fairly insignificant 1 episode G1 character I really like Nightbird Shadow. She's by no means an essential part of anyone's classics collection but if you've always wanted a Nightbird and don't want to go the Impossible Toys route (either the transforming TFCon 2010 exclusive or the standalone action figure) I think Takara LG15 Nightbird Shadow could fit the role and she's an incredibly fun to to boot! If you didn't like the Arcee mould there aren't enough changes to Nightbird that it would likely change your mind but who knows?